Breakfast is the most important meal of the day, or so I’ve heard, and that meal is made much easier to prepare with a set of nonstick frittata pans. My friends and family members love gathering in the morning (or afternoon) around the Italian interpretation of the traditional omelette. The fluffy, savory dish is a perfect balance of healthy ingredients and delicious flavors. Do you really need a frittata pan, though? In this article, I’ll try to demystify frittatas, frittata pans, and proper frittata technique. We’ll also take a close look at several frittata pans and go over what specific features make the Cuisinart set great and why it might not be the best choice for your kitchen. The Cuisinart FP2-24BK isn’t just a great frittata pan set. It’s one of the best sets of non-stick pans on the market, period. Cuisinart delivers an excellent combination of everything you want in a non-stick pan: solid construction, a resilient coating, and simple engineering. As a result, this pair of pans is worth purchasing for regular use, not just for making frittatas. Most importantly, however, it’s the best set of pans for frittatas as well. The interlocking design – as opposed to a hinged design – ensures that there’s no additional stuff on your stove. You add in the lid (or the other pan, in this case) when you need it, not before. 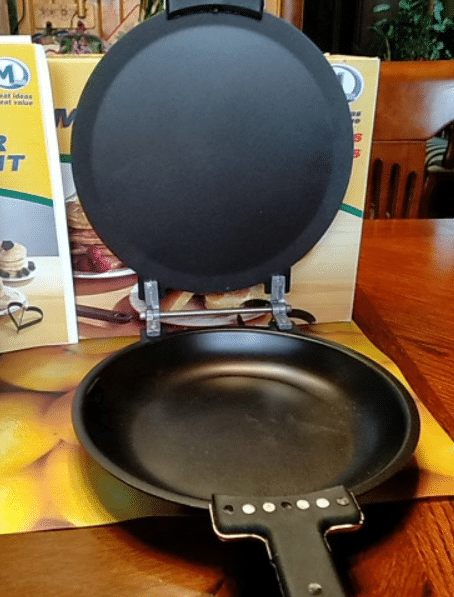 This lets you observe and adjust your frittata as it cooks and ensures that the pan itself is light and easy to use. The simple helper handles interlock incredibly well. A tight fit between these two pans is afforded by Cuisinart’s quality engineering. You’ll see some leakage if you try to flip over a pot full of water or other liquid, sure, but as far as partially-cooked eggs go, these pans are pretty close to perfect. Most nonstick pans these days follow a common formula: aluminum body, non-stick interior, polished exterior. These pans are no different. They’ll perform quite similarly in terms of heating and cooling to your favorite pans from other brands. The aluminum bases are cheap, light, and can stand up to some pretty serious abuse. That said, non-stick itself isn’t the most durable thing in the world. The interior coating in these particular egg pans tends to hold up for a couple years of use, but you won’t be giving these pans to your grandchildren. This is difficult to avoid: both PTFE-based (Teflon-style) non-stick coatings and ceramic interiors will wear out after a couple years of use. Cuisinart’s non-stick of choice seems to last longer than the average Teflon pan, with many customers reporting four years of use or more, but your experience might differ. The biggest downside to non-stick pans like these is the lack of oven safety. The ergonomic handles are made of a synthetic material that doesn’t like broiler-levels of heat very much. More importantly, the PTFE coating that’s used in pans like these can start to release unpleasant gases when it’s heated in an oven to above 400 F. This means you shouldn’t use this frittata pan set to start a frittata on the stove and finish it in the oven. Overall, I think that this Cuisinart frittata pan is an excellent product for a number of reasons. The one that really does it for me is the combination of utility and price. 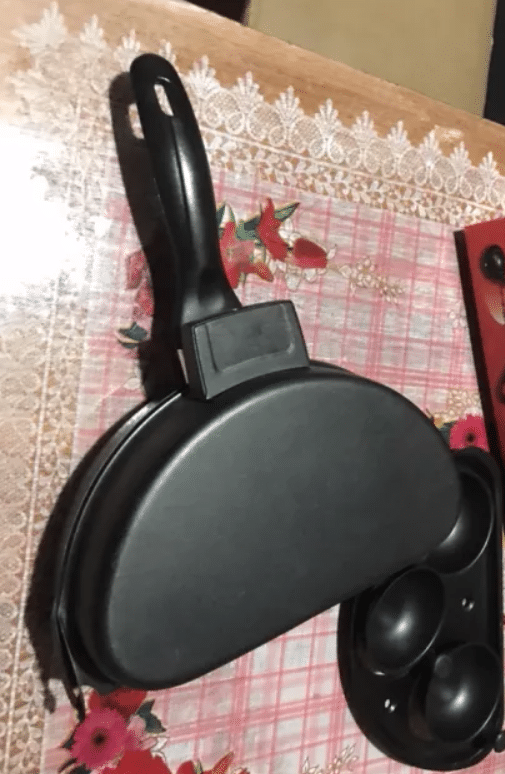 This set of two 10” frying pans is pretty darn cheap, making it a competitive option if you simply want two non-stick pans to use for eggs and other common “sticky” dishes. The addition of locking helper handles is nice, but it’s not necessary for this set to earn my recommendation. The low cost, durable non-stick and reputable brand have done that already. In other words, this frittata pan set is probably perfect for your household. If you’d like to check out some other options, however, I’ve picked out a small folding frittata pan and a particularly oven-safe pan below. These choices might not beat this Cuisinart set in terms of value, but they will give you some unique features that you can use to change how you cook your frittatas. This Korean-made non-stick pan is about the size of a normal 10” pan when it’s unfolded. While it’s in use, however, you have the option of folding the pan in half lengthwise. This creates a similar semi-sealed cooking vessel that you can use to effortlessly flip eggs of all sorts. While this small frittata pan is high quality, it’s also priced comparably to the Cuisinart above. Remember that the Cuisinart set gives you about twice as much cooking area per pan, and it comes with two pans. This folding pan can’t be used simultaneously on two burners, nor can you lend half of it to a neighbor. In terms of utility, you’re definitely getting a worse deal. Quality wise, though, this pan is excellent. It’s got just the right amount of heft as well as a sturdy steel handle that can deal with the heat of your oven fairly well. The hinges seem quite durable and make the task of opening or closing the pan extremely easy. I certainly don’t have any complaints about the construction of this pan. Like the Cuisinart set above, the non-stick coating in this pan is not particularly oven safe. Its lifespan is probably going to be measured in years and will almost certainly stay in the single digits. Still, it’s not prohibitively priced for the average household. 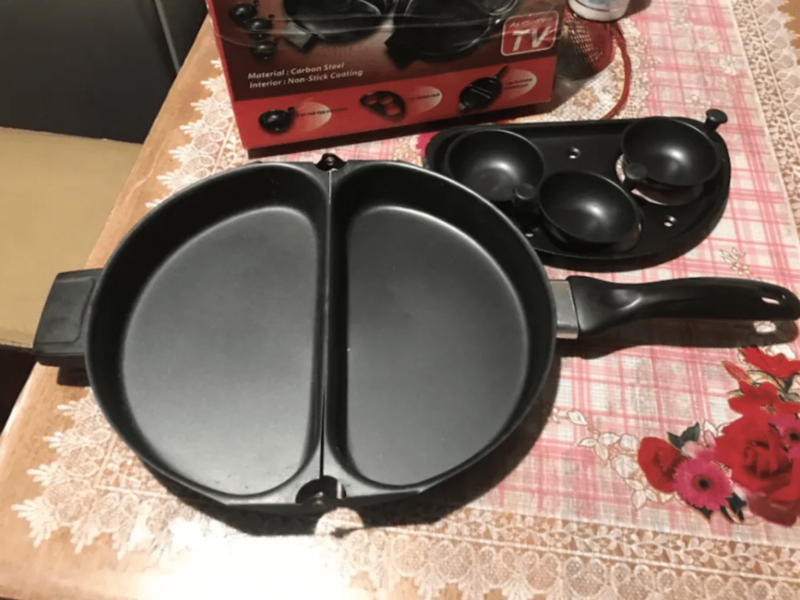 If you’re looking for a pan for small frittatas, you don’t want to fiddle with interlocking helper handles, or you simply think that this folding omelette pan looks better, there’s nothing wrong with the TECHEF frittata pan. I do think, however, that the Cuisinart above is usually a better option for most households. Be sure to check both pans for major online sales! Also made by Cuisinart, this enameled cast iron pan is perfect for anyone who prefers to finish their frittatas under a salamander or in the oven. It’s practically impervious to heat at sane home cooking temperatures and is very, very sturdy, making it the most durable choice here by a pretty wide margin. The big difference between this pan and the two frittata pans above is the material used in its construction. Cast iron is heavy, doesn’t heat up very quickly, and will last for literal decades in your kitchen. This is because there isn’t a fancy chemical cooking surface coating the interior of this pan. Instead, it’s simply plain old cast iron. With a bit of time and knowledge, you can build up a layer of something called “seasoning” that will make this pan fairly non-stick under actual use conditions. Fans of cast iron swear by their cast-iron cooked eggs, claiming that their carefully seasoned pans are just as non-stick as something with Teflon. 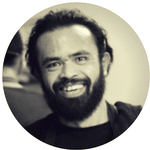 Whether this is true or not will have a lot to do with your level of experience and how you care for your pan. If you manage your temperatures well, use an appropriate amount of cooking fat, and properly maintain the seasoning on your pan, you’ll be able to slide frittatas off of this bad boy with ease. If you don’t, however, you’ll probably find that you make a big mess every once in a while. The exterior of this pan is coated with vibrant enamel that keeps things smooth and safe for the rest of your kitchen. Cast iron can be rough, making it dangerous for your cupboards and countertops. The enameled exterior of this pan is nearly as durable as the cast iron it protects and will help keep you from accidentally scratching your kitchen. Again, the big upside here is the fact that you can finish your frittatas in the oven under the broiler. This pan is oven safe to something like 500 F according to Cuisinart. This means you should have no issues getting things real toasty and crisping up the top of your frittatas under high heat in the oven. It’s much safer than trying to do this with a non-stick pan since you don’t have to worry about damaging your nonstick or melting off plastic components. If this sounds nice to you, this is probably the pan to choose. It has the other benefit of lasting for many times as long under normal use conditions. The enamel may chip eventually, but that will likely be the result of falls or rough handling and not normal wear and tear. 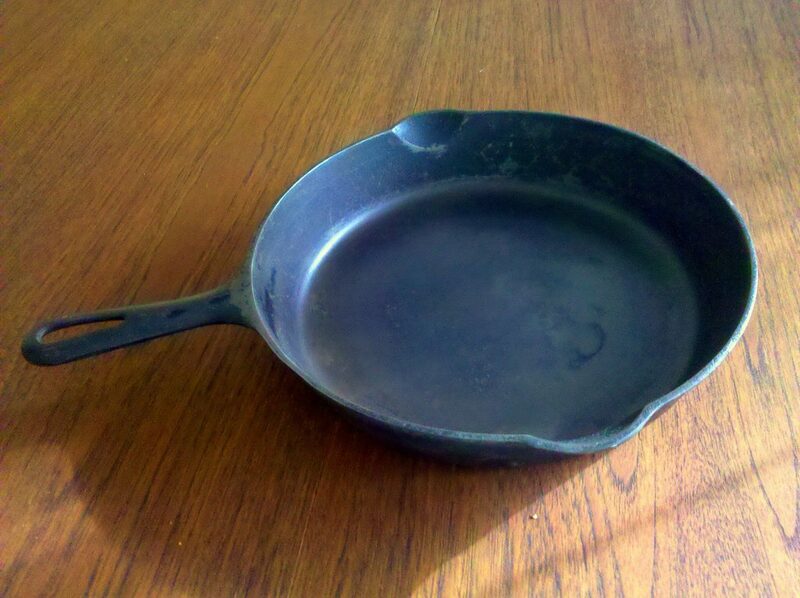 Cast iron pans like this one are often passed down from one generation to the next due to their extreme longevity. If you’d rather not fiddle with keeping your pan seasoned, however, there’s nothing wrong with picking up one of the non-stick sets above. You’ll save yourself some money and lots of headache when it comes to maintaining your cast iron and effortlessly sliding your eggs out of your pan. Purpose-built frittata pans are special-purpose cookware pieces that are designed to be perfect for cooking eggs over low heat. They’re often non-stick aluminum pans, although many cooks use stainless steel or cast iron cookware for their frittatas as well. 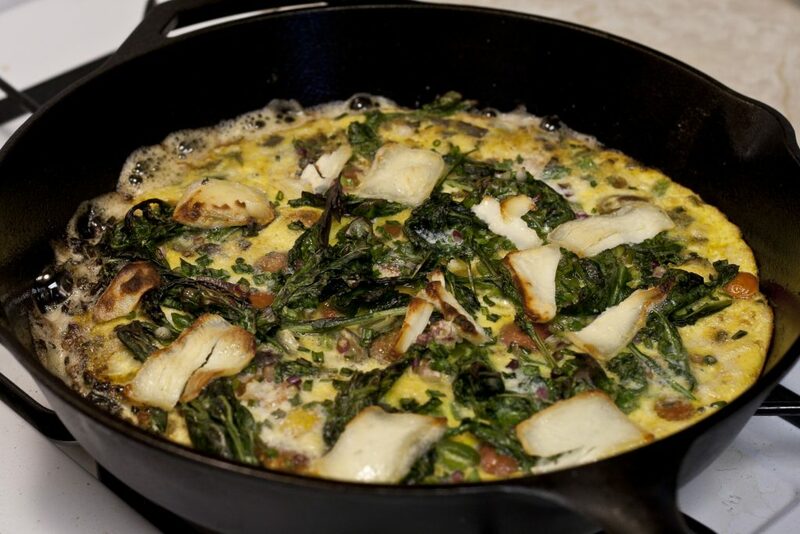 Specialty frittata pans usually consist of two pans that lock together or are joined by a hinge. Aside from this novel bit of construction, these pans are otherwise pretty similar to any other pan you might use to cook an egg. Frittata pans are built to perform one specific task: flip a large omelette-like egg dish without folding the egg. This is achieved by fully enclosing the frittata. 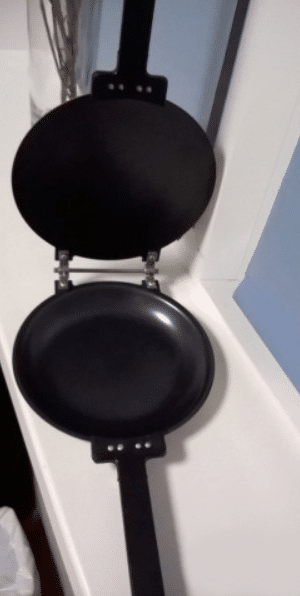 By placing two pans on top of each other, insides facing in, you essentially create a cooking capsule that can be flipped over with no mess or hassle. This allows you to flip a frittata without folding it in any way, shape, or form: you simply rotate the pan. Frittata pans are pretty darn cool in terms of practical engineering. Using a frittata pan is simple: you make a frittata, place it in one half of the pan, and cook it most of the way through. When the bottom is done, you lock the pans together (or close the hinge), flip the pans over, and resume cooking the frittata from the other side. If you’re not using special-purpose frittata pans, you can still cook a frittata in a variety of ways. The most popular is to cook the top of the pan using indirect heat. This might take the form of a salamander, a torch, or a broiler. All you need to do is bring the frittata under your preferred heating element and let the top cook. If you choose to use this method of cooking a frittata, be careful with the type of pan that you use. A non-stick pan that’s only oven safe to 350 degrees probably shouldn’t go under a broiler. These aren’t the only ways to cook a frittata! As long as you cook your eggs slowly over low heat and make sure you cook both the top and the bottom without folding your frittata, you’ll be fine. Feel free to jerry-rig your own frittata flipping device or cook the whole thing in the oven if that strikes your fancy.. Don’t be afraid to experiment! As long as you cook the eggs, you’ll wind up with something that’s both edible and delicious. Frittatas are famous for their solid, circular shape and even doneness on both the top and the bottom. Frittata pans are an easy way of achieving this effect at home. A set of interlocking pans like the Cuisinart set above will let you turn over your frittata without any spatulas or guesswork. You simply put the pans together, flip them over, and finish cooking the frittata in the other half of the set. If you’d prefer an oven-based approach, however, I’d recommend a cast iron pan. Many frittata recipes call for a brief stint under a broiler. Non-stick pans don’t like this sort of exposure to heat from the top. Not only will a cast iron pan solve this problem, it will also last for much longer than your average non-stick pan and give you a perfect tool for searing steaks and cooking cornbread. Whichever option you choose, you’ll notice a big difference in your frittatas when you have the right tools for the job. The pans above are some of the most durable, cost-effective, and easy-to-use options on the market. You can’t go wrong with any of them!